A page in our photo Gallery – Flooding in the Parish – illustrates the widespread floods in the valley in January 2014. They show just how spectacular the flooding was, but thankfully in most cases there was remarkably little damage. Thanks to all the people who have contributed their photos for this. Flooding – What happened then. Parts of the parish have been affected by flooding several times over the last twenty years, but we have never been so badly hit as we were in 2012 and 14. We are in an unusual situation here; two streams cross the lower part of the parish – Parson’s Brook and Waterhead stream flow down from different parts of the catchment and on into a tidal stretch of the River Avon. Since there was so much damage to many properties in Aveton Gifford in 2012 a lot of people have worked very hard to get something done to try to prevent these conditions happening again. Obvious damage happened on several occasions then when 3 houses at Tree Corner and 3 at Waterhead all flooded above window-cill height, and the village hall was also badly affected. 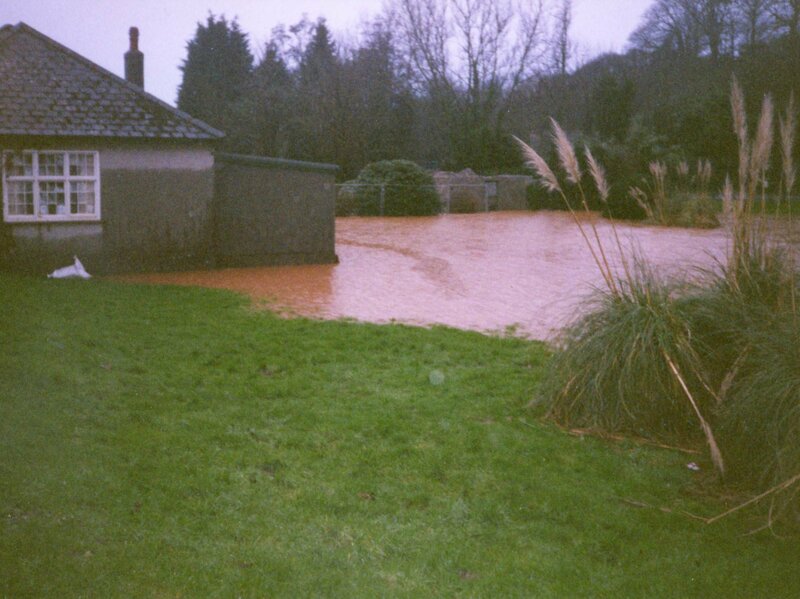 The school and several nearby houses on Fore Street were all affected by run-off from the fields and small stream behind them. 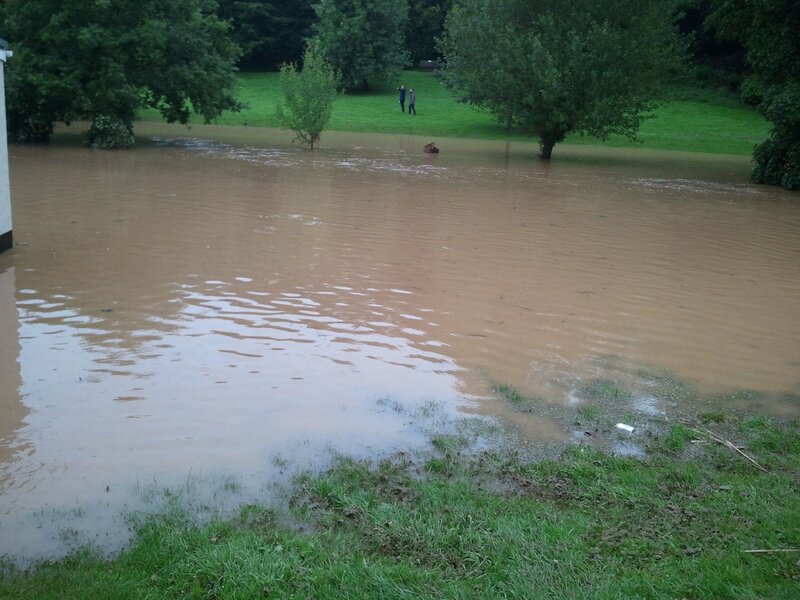 Parsons Brook also burst its banks, cars in the village hall car park were written off as a result, and the village hall and several properties adjoining the brook also suffered damage. In some cases the force and depth of the water was a serious threat, particularly for some of our older residents. The damage nationwide, and resultant clear up and repair gave rise to a more positive attitude in central and local government to try to tackle some of the issues, and Aveton Gifford has benefited from this with the work to enlarge the culvert under the bridge at Tree Corner (the previous culvert was far too small to cope with the quantity of rain after a flash rainstorm) and the replacement parapet on Waterhead bridge (previously the bridge acted as a dam to prevent the flow of water). Both of these repairs were funded by Devon County Council, and the work was undertaken in 2014. Since then similar flash rainstorms have affected both these streams, but now that the “dam” effect at both bridges has been removed the nearby houses have remained dry; householders previously affected all feel sure that these two improvements alone have made a dramatic and positive difference to their flood risk. Waterhead stream – previous flooding, and the new parapet with several gaps in the stonework on both sides to allow flood water to flow both below and above the roadway, and carry on down the stream. Along with the wider work done by other authorities the community here began to address some of the other issues helped by the Flood Resilience Community Pathfinder Project. Aveton Gifford was one of fifteen communities across Devon to benefit from being part of this pilot project; if the parish could get a group of volunteers together to tackle some of these flood issues then there would be help and advice for us to set up and organise our own flood prevention measures in the parish. As a result we set up our own self help flood resilience group chaired by Rob Ford and including many of the householders who had been affected, representatives from the hall, the school and the pre-school, and several other volunteers who were willing to help. And what we can do – our own flood prevention measures. AG Flood Group – The Aims. To identify the vulnerable areas in the parish. To identify the causes of flooding there on each occasion. To understand what the threats are in terms of weather conditions. To understand what the threats are in terms of safety. To set up a flood alert system of our own  many of the national warning systems are not always relevant here, and we needed something more appropriate and reliable. To put in place preventative measures where possible. To make an action plan so that danger and damage is limited during a flood. and as time went on; To share and gather further information through Flood and Community Resilience Forums to enable our own parish community resilience. There were various issues that were beyond the remit of a volunteer group, and solutions that the parish or district council would have to tackle, but the group could help to identify and give evidence for some of these issues. FACEBOOK – sign up for alert for flood warnings! Residents can sign up for EA’s Floodline Warnings Direct – a free service that provides flood warnings by phone, text or email. You can register online on the EA’s flood page or by calling Floodline on 0845 988 1188. It is worth pointing out that these two Floodlines only apply to specific areas – Environment Agency warnings apply to water levels and tides in the RIVER only, NOT in the two streams up the valley. We have been advised that a Met Office forecast of RED ALERT should mean that everyone should take what preventative measures they can then, not wait to see what happens when the storm is upon us  by then it is usually too late, as these floods are on us with such unexpected speed. However, although in recent years these conditions have only hit us on RED Met Office alerts, we were fortunate then that the tide was not high. As some of our recent high spring tides have shown us, it is worth being much more aware of potential floods when there is a combination of spring tide, onshore south westerly wind, a low pressure forecast but maybe only an AMBER or even a YELLOW alert. Heavy rainfall is more difficult to predict, and in spite of more accurate weather forecasts nowadays, rain does not always follow the expected direction or quantity so flash floods are much more difficult to predict. Many of our floods have been caused because of flash storms in the catchment areas of the two streams through the village and Waterhead. With advice from the Flood Resilience Project and the availability of grant money Aveton Gifford has been able to install two different monitoring systems. A rain gauge has been installed on a farm to the south west of the parish – this is in the path of the prevailing rain-bearing south-westerlies, and should give adequate warning of above average rainfall further up the catchment before the two streams carry flood water down to the village, giving householders and hall representatives time to make whatever preparations might be advisable. A second gauge measuring the height of the water in Parson’s Brook by Mill Cottage will trigger alerts so that the height of that stream can be monitored, and preparations be made if necessary. Alerts from both gauges are transmitted through phone calls to appropriate residents and flood group wardens. (In past years a klaxon was installed in the pub to alert residents – please note – this did not work! Nobody could hear it, so it is never used now!) Both of these gauges have been installed so that people can monitor the water levels, giving them time to take action if required – particularly important as some of these flash floods have happened in the early hours of the morning. In addition grant money has been available to many of the 2014 affected households, and they have been able to have flood doors and other preventative measures installed. Grant money has also provided equipment for use by the Flood Group and volunteers to take preventative action, and in the worst case for clearing up afterwards. The Flood Resilience Project was set up with householders and residential properties in mind. However because our one community village hall has been so badly affected by flooding in past years, Aveton Gifford was very lucky to be able to benefit from additional grant money to make flood resilience improvements to the hall. Sandbags, sandbag stores, and the alternatives. Some people have found that they can get a better seal around entrances using bricks or breeze blocks with plastic sheeting, either with, or instead of sandbags, but again you will need enough to build the type of “wall” shown in the pdf above. They do also have the advantage that they can be stored and moved more easily, and don’t deteriorate like the sand bags. Sandbags can then be used if you have them to put on the top to give added weight and stability to your “wall”. There are limited supplies of sandbags kept here for use in emergency. A shed has been put up by the drive into the village hall, and some sandbags will be stored in that. There will also be a smaller store for sandbags for the school. It is unlikely that there will be enough to go round to householders at the last minute when a flood alert is on us, so if you think you may be affected by flood water or rainwater run-off yourself, it would be wise to get in a supply of your own to keep at home. The outer casing of sandbags will perish over time, particularly if they are left in sunlight, so it is suggested that you keep your own bags stored in the dark if possible. Use this SHDC sandbags link for further information. We need to keep any property close to the stream fixed securely, so that it cant be washed away. In previous floods one of the wooden bridges across the brook on the Rectory Lawn washed down to block the culvert by the hall, and probably made the flooding in the hall worse. The 2 wooden bridges here have been anchored down again, but if you have anything which might wash away please can you fix it securely or move it out of harms way – rubbish bins, garden furniture etc are all things which might wash downstream and obstruct a bridge or a culvert, and could pose a real threat to safety if trying to clear them. ….. and surface water drains. After a day of investigating the flow in the village drains with a coloured tracing dye the flood group found that many of them were blocked, and the drainability of the rest were severely limited; regular council maintenance on the villages drains had not been done for quite some considerable time, and in several places they had become completely solid with silt and gravel. Peter Smith has also plotted all the drains and gullies around the village for the flood group and use of the parish council in their negotiations with DCC. There is a strong suspicion that many of the problems people have experienced in the last few floods have either been caused or certainly made much worse because our drains dont drain. SHDC budget cuts are now so stringent that visits from parish lengthsmen and gully clearance machines are extremely rare, the parish council can no longer rely on either of them for regular maintenance. The blocked and impacted drains in the village have all now been cleared – mainly by volunteers, in particular Peter Smith – but will now have to be kept clear. For smaller blockages it would be a huge help when you know you have drains near you that are prone to getting clogged up if you could please help us out and take them on, as it’s usually just a case of keeping them twig and leaf free! For more resistant blockages you can help us all if you can let us (flood group) or Peter Javes (parish clerk) know asap if any of them are filling up with soil or gravel, or arent managing to take the water away from the road. There is also a link here to a DCC web page where you can report a highway fault directly to them, and that includes blocked drains or gullies and flood damage. You need to report each drain individually so that it can be identified properly – we were advised that you need to give the correct postcode to help DCC pinpoint the right one, but in fact there is an interactive map on the system that you can click on to confirm the place as well, so the post code isn’t essential. In past years flood water caused sewage overflows from the foul sewer manholes, particularly in Jubilee Street after exceptional rain. Residents need to be aware that raw sewage might leak down the road here to the brook. Flood water can also affect one of the sewage systems near the Hive and the Primary School, and on rare occasions in exceptional rain storms sewage has leaked out into water flowing down past these two buildings. Parents and staff do need to be aware that this might happen, and to take the necessary hygiene precautions, and to be aware of possible contamination of footwear and clothing. (We have been advised that a major cause of an e.coli type of infection is when children remove their own footwear after walking through polluted water, but don’t wash their hands thoroughly immediately afterwards.) If you have any suspicions at all that there might have been a sewage spill in that area, please alert members of staff in both places ASAP ! There are also occasional sewage spills down Townswell Lane, and by the bottom of the steps up to Icy Park, so please be aware of these too. With all these spills, please do feel free to report them yourself (see numbers below) but it would be very helpful if you could also alert our Parish Clerk too; he will report them as well, but it would also help the council with information in its ongoing negotiations for South West Water action. If you suspect there has been a sewage spill as a result of flooding, you can report it to South West Water: 0800 169 1144 (24 hours). It would be really helpful if you could also report it to the Environment Agency Hotline: 0800 80 70 60, as any sewerage spill here goes directly into the stream. These reported spills have to be recorded by the EA, and investigated. The investigation may take a few hours or so, but the fact that they are recorded with a dated incident number is extremely helpful in building up a picture of leaks when negotiating with these authorities. Sewage solutions – WaterShed Project. The parish council with the help of MP Gary Streeter is now working with South West Water about our problematic sewage leaks in various parts of the village following flash or prolonged rainstorms. The solution is a project named WaterShed AG; to remove a large proportion of surface water from the drainage system and treatment works by enlisting the co-operation of householders in a scheme to divert their own surface water into a sustainable “water attenuation” system, such as a bog garden, soak away, or water butts, instead of into the main drains. 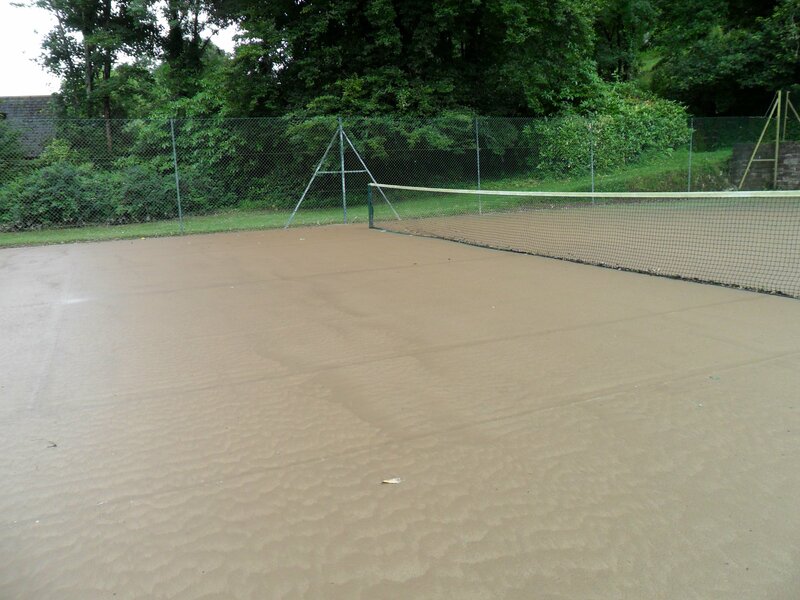 Drainage work has been undertaken by SWW in early 2016 to divert surface water from all the roofs and tarmacked areas in both the school and hall grounds – this made up 25% of the total volume of water entering the sewers during a storm. Instead of going straight to the drains and overloading the system, it should now go directly into the stream. After several stages of work, new drains laid from the school to the stream were signed off and commissioned in 2017, and we await the next heavy flash floods to test whether this work will have solved the problem. There have been other modifications to the drains too, including piping the overflowing spring water from the old village well in Townswell Street straight to the stream rather than down to the foul water drains. We sincerely hope that this work will finally solve the assorted sewage problems in the village out. Parish councilors will be able to give further information about this scheme – see parish council for contact details. Parking in the hall car park. Cars have been damaged or written off in past floods in the hall car park. Often the owners cant be identified and alerted, particularly in enough time to move them when the water is rising. With the permission of the hall committee a WARNING NOTICE will be displayed on the notice board to the left of the entrance to this car park whenever there is a RED ALERT for this area, advising that it may not be wise to use the car park at this time. The water may affect well over half of the parking spaces here, and although this car park is usually full at night there is other parking in the village that could be used instead. As well as the warning notice, we will use Aveton Gifford Community Facebook flood alerts – see top of page. Once a Met Office warning about possible flooding has been received from Devon County Council we will try to publicise this as widely as we can. Residents may need to be aware that there is a possibility of the car park flooding when these warnings are issued, and it might be helpful to find alternative parking if possible just for that short period of time. Several places in the village may be unsafe in the event of another flood. There is obvious danger from the speed and height of Parsons Brook when it is in full flow, and all crossings over the stream should be avoided at all costs  and this includes crossing over the water splash on the tidal road by Timbers car park; the force of the water from the stream crossing the road is enough to be seriously dangerous. The force of storm water down Jubilee Street can also be hazardous, as many of the surface drains in this area are unable to cope with the flow. The small stream that flows down the valley by the entrance to The Hive can become a torrent in flood conditions, and washes down through school grounds. Representatives from the Primary School, the Hive and the flood group have worked together to resolve some of the problems that make the flood water so hazardous there, but even so we have been advised that parents and teachers need to be aware of the flow of water near The Hive, and in the school grounds. The Fisherman’s Rest – emergency hub ! If the village should experience another big flood Athenia and Mark have offered the use of the pub as an emergency centre. The flood group will use it as a base for co-ordinating the volunteer work teams in the village and liaising with the police and emergency services where necessary. Members of the Primary School school staff and governing body were helpful in negotiating flood prevention measures. During the 2013-14 Christmas break the school grounds were regularly monitored to ensure that flood water didnt build up during the heavy rain storms, and arrangements have been made to build the replacement equipment sheds on raised blocks to prevent them from damming back the flow of rain water. A sandbag store has been placed in the school grounds, and bags will be used when necessary to divert the water flow away from neighbouring gardens. The parents and staff at the Hive Pre-school have been most supportive of flood preventative measures, and have undertaken to clear and maintain the drains and silt trap at the Hive. This has definitely been a problem area in the past, and their help here will make a tremendous difference to the properties further down the hill below them. …… and since the floods of February 14th 2014. We hope this really was our “one in a hundred” event. The exceptional high water and storms of February 14th with a combination of unusually high spring tides, gale force onshore winds with hurricane force gusts, and a dramatic drop in atmospheric pressure caused the highest water in the valley since the 1970’s. The relentless rainfall in the preceding month also meant that the water table in the surrounding countryside had risen to capacity, and the ground was already saturated. Several properties adjoining the river were affected by the highest tides with driving onshore winds that most of us had ever experienced, but on the positive side, properties in the village at Tree Corner and the village hall were unaffected. The parish as a whole escaped remarkably unscathed, particularly when compared to the devastation in other parts of the country – however gales also caused some damage to roofs and trees in certain parts of the parish. Since then we have had the impetus to help ourselves become more flood savvy, and to set up our own resilience group. The work of this AG flood group has undoubtedly helped to raise awareness in the community of the particular problems and vulnerable areas, and the group is pleased to be able to report that several areas which might have been affected before have in fact been flood free since. The community has benefited from rain gauges, equipment, advice and training as a result of the DCC Flood Resilience Project. There is an obvious improvement now with our two repaired bridges, and a greatly increased awareness and understanding of past problems by the authorities with responsibility for flooding issues. Dredging to Parson’s Brook, and clearing the impacted silt from under the bypass was finally undertaken in October 2015 – a report on the works can be read in the Oct/November 2015 issue of the mAGpie. A few days after it was all completed we had a few days of heavy and sustained rainfall; the volume of water coming down the stream was again much greater than usual, and meant that we could “test” it almost immediately. It was obvious that everything that had been done to lower the level of the bed of the stream and culvert and to create a gradual fall right down from the ford to the exit on the Tidal Road, along with all the work to cut back the overhanging edges and pinch points in the banks, seems to have been a great success, and the water was carried on through from the centre of the village more effectively. 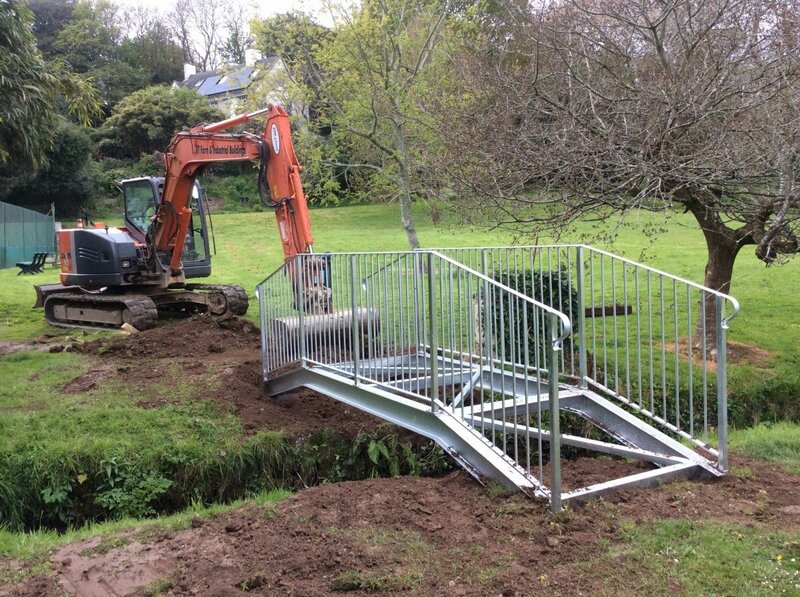 We hope that this improved faster flow after high rainfall will help to scour the bed and banks of the stream more efficiently, and that this will help to keep it clear. The parish Emergency Plan has been drawn up, and a separate Flood Plan details the actions to be taken before, during and after flooding, using our teams of volunteers and flood wardens (trained as part of the input from the DCC Flood Resilience Project).And finally, a big thank you to all our volunteers who have helped to accomplish so much in such a short time, and to everybody from the Primary School, Hive and Hall who have been helping us to put these preventative measures into effect. When the wooden bridges were taken out in May it could be seen that the fixings had already started to rot, so if nothing had been done about them this could easily have happened again. 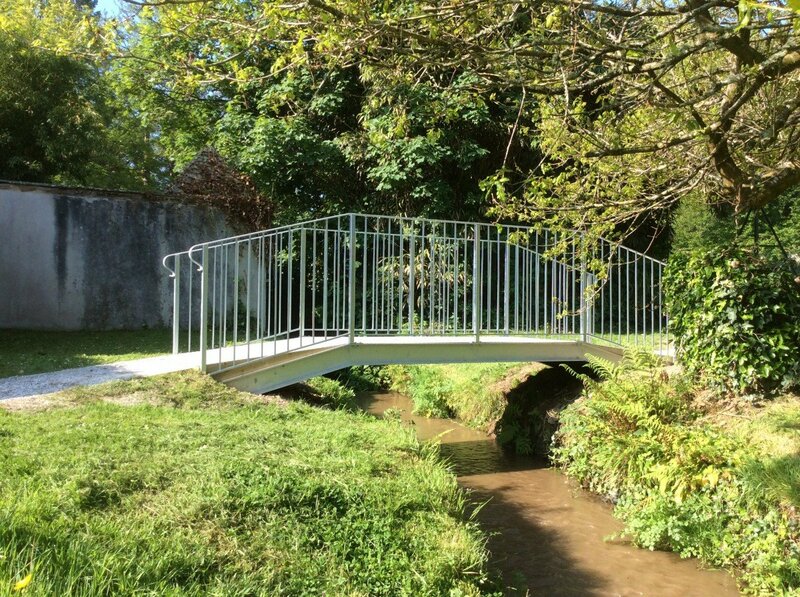 These new galvanised bridges are longer and much higher than the old ones so flash rainwater can flow right underneath without any obstructions, and they are also heavier and much more securely installed to reduce any danger of washing away. Since they have been put in place some modifications have been made to reduce the gradient of the ramps at either end, and to reduce noise from the metal surface. 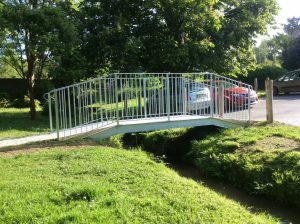 Both bridges will then be finished with a non-slip top coat which will be laid down over the metal walkway to make them safe in all weather conditions. Once all the work is complete they will be almost maintenance free, last considerably longer than the old wooden ones, and make a positive difference in reducing our flood risk to properties. They have been paid for out of money for our flood resilience measures. This will take you to a lot of information including flood forecasts, and advice about how to prepare for flooding, and during, and then after a flood. 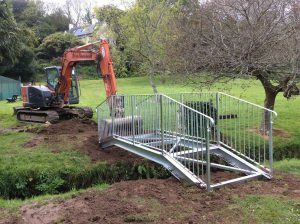 South Hams District Council flood prevention, with advice and downloads and further links to other agencies. National Flood Forum has advice on insurance and flood protection. If you have a waterside property the Environment Agency’s page for riperian property owners may be of interest. This is the report commissioned by DCC into the specific factors which contributed to the flooding in Aveton Gifford village. This update gives the background to how Aveton Gifford became a part of the pilot scheme for the Flood Risk Management Team. The following three reports were published to summarise the various flooding events in 2012.